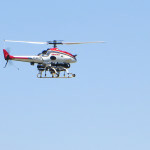 UAV test flight in Prosser, Wash. Rain can cause splits in the skin of cherries and similar fruits, rendering them susceptible to premature decay and, thus, commercially unmarketable. Growers use hovering helicopters to dry off cherry crops after a rainstorm, but that is costly and can be dangerous. WSU will spend the next few months testing the Yamaha RMAX UAV – an unmanned, 11-foot helicopter – as an alternative. If the trials are successful, the device will be tested in the field specifically for removing water from tree canopies to prevent fruit cracking. WSU is the first to test the device for this purpose. Watch a two-minute flight demonstration video (above) at https://www.youtube.com/watch?v=-X9U6lQjNi8. 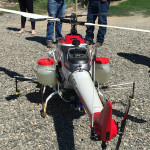 “Traditional helicopters can be cost prohibitive and problematic, and there is not any hard data on the effectiveness of helicopters and orchard sprayers for rainwater removal,” said Lav Khot, assistant professor of biological systems engineering at WSU’s Center for Precision and Automated Agricultural Systems (CPAAS) in Prosser. “We hope our research will show the efficacy of the RMAX and also analyze data to share with tree fruit growers,” he said. Developed in Japan, where there are approximately 2,500 in operation, the RMAX has been used for spraying rice crops since 1997. The UAV weighs 141 pounds and has a load capacity of up to 61 pounds. 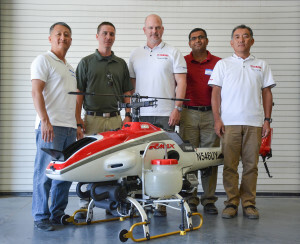 WSU’s Lav Khot, second from right, and team with the UAV. In the future, Khot said he hopes to research the effectiveness of the RMAX for targeted spray and chemical dispersal applications. “In Japan, it is common for family farms to pool resources to utilize the RMAX to spray their fields,” he said. “We could foresee the same partnering with farms in the Pacific Northwest. “We are excited to get the data sets back and work with Digital Harvest and Yamaha on the next phase of testing,” he said. The research is funded through the Emerging Research Issues grants program of the WSU College of Agricultural, Human and Natural Resource Sciences. CPAAS researchers and the WSU Office of Economic Development – along with the Washington Tree Fruit Research Commission – are working with Digital Harvest Corp. and Yamaha Corp. to explore applications of UAVs to improve various aspects of tree-fruit production. Before testing the machine in the United States, the two corporations had to work with the Federal Aviation Administration to obtain a 333 exemption to fly and test the device for research purposes.